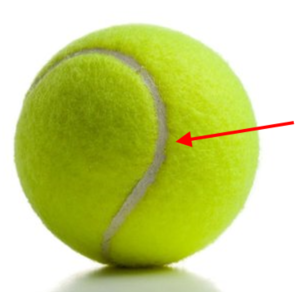 Why does a tennis ball have a curvilinear oval that goes around it? Tennis balls are mostly covered with felt, and they have a white curvilinear oval that goes around them. Is there any reason tennis balls have that oval, instead of just being completely covered with felt? That oval seems to be the same shape as the oval of stitches that goes around a baseball, and the stitches definitely affect the movement of a baseball. Does the oval affect the movement of a tennis ball? Or would a tennis ball move the same way even if it was covered completely in felt? The felt is attached to a rubber sheet. (You can't push as hard on an assembled ball as you can on the sheet material). And since you can't cut a sphere out a single sheet of material, there has to be a seam somewhere. In the past, the sheet was cut into a "clover leaf" pattern that was then folded and assembled into a ball. Later, it was changed to the modern "half shell" pattern (which International Tennis Federation says was to increase the uniformity of the ball). The rubber seam replaced stitches in the older balls and joins the pieces together. the stitches definitely affect the movement of a baseball. Does the oval affect the movement of a tennis ball? Or would a tennis ball move the same way even if it was covered completely in felt? A baseball is mostly smooth with a set of seams that can be oriented in a few different ways. My suspicion is that the reverse on the tennis ball (a small smooth patch) has significantly less effect. I found one paper on tennis ball aerodynamics. Tables 3 and 4 at the end compare lift and drag on a modeled sphere and a modeled sphere with a seam. The numbers are very similar and the effect of the seam is not called out in their conclusions. Not the answer you're looking for? Browse other questions tagged tennis equipment or ask your own question. Recommended drills to help keep your eye on the ball? What is the logic behind re-serving in volleyball and tennis? How do the leading makes of red cricket ball vary in performance? How do you hit a shot without spin in tennis and is there anything equivalent to a knuckleball? Why do Baseball players cover their bats? Why have some MLB managers stopped wearing uniforms? How can I choose a type of golf ball to play with? Does the man with an extra day of rest at the Australian Open have an advantage? Position of holes on a floorball ball?